When you need to protect a forest or a large rural area, you need a way to get to fires fast no matter what the conditions are. 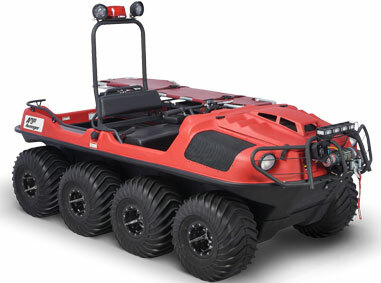 Argo’s XTVs are designed to move your crew and firefighting equipment across any terrain to fight fires directly or apply retardants ahead of time to protect inhabited areas. Crossing mud, water, and ice is no problem. The compact size of an Argo lets it get into places that traditional firefighting vehicles can’t, whether you need to access a collapsing tunnel, drive over building rubble, or weave between trees in a forest. Working on a shore line or with islands? XTVs can drive straight into water and back out again, so there’s no need to switch to and from a boat or even find a dock to go between the two. If you need more speed than the paddle-like tires can deliver, an outboard motor can be added for faster water transport. Have to get to extremely remote areas quickly? Argo offers a D-ring kit so your XTV can be lifted with a sling for helicopter transport, letting you drop it off right next to the fire. Argo’s stock machines give you most of what you need to get the job done, while their accessories help you create a vehicle that meets all of your needs. A standard Responder is built to carry a stretcher and first aid equipment, and a fire suppression system can be added that carries 50 gallons of water and 5 gallons of foam. These vehicles are available in red or orange for visibility, and additional lights including a ROPS-mounted strobe can be added. Need room for axes and other tools? The vehicle’s carrying capability can be further expanded by adding racks, or by hitching an Argo amphibious trailer to the back. This trailer uses the same hull and tire design as the XTV, letting it go anywhere the vehicle can go. How are these vehicles used by fire departments? The Harvey Volunteer Fire Department in York County, New Brunswick, has to fight fires in rural farming and forestry areas as well as nearby Harvey Lake. By having an Argo available, they can reach fires quickly anywhere in their jurisdiction. The same goes for 15 fire departments in Japan who use their XTVs to tackle fires during floods and high winds during the monsoon season. Ancient trails through the mountains and forests are often too small for traditional vehicles, but with the Argo’s tight turning circle and compact design, navigating them is no problem. That means shorter response times in both rural and developed areas.